It was 1986. Seated next to my desk in an old oak armchair was Congressman Dennis Hastert. I worked for a Chicago suburban newspaper group that had just started another paper that was reaching a new readership area and the publisher put me in charge as editor and everything else that went along with starting a new paper. 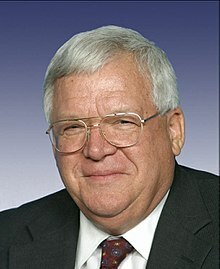 I had never met Hastert. When he had been in the Illinois House he did not represent our coverage area but now we had expanded and so did he; to the U.S. House. He had just won a close election to replace a congressman who was battling cancer. I couldn’t initially figure out why he wanted this meeting. While our newspapers were well known and had been around a long time, we certainly didn’t have the clout of the Tribune or Sun Times and besides, he had already won the election. It appeared to be a simple meet and greet. He said he wanted to congratulate us on starting a new paper and meet the editor. I must say I was surprised, as most members of congress only bother with the big fish. His demeanor was so aw-shucks and laid back I almost forgot he was a politician. I said almost. He didn’t dress like the typical blue-suited red-tied politician either, brown suit, slightly rumpled. He said his friends called him Denny or coach. He spent a lot of time talking about his humble beginnings doing farm work, his teaching career and wrestling. He didn’t seem in any kind of rush, as most politicians are prone to remind you how busy and important they are while rushing the conversation. He did not speak in political jargon or weigh his words carefully when I asked a few questions. We talked of Wheaton College, where he went to school and I occasionally gave talks on community journalism (I disliked public speaking) because I somehow could never say no to professor Arnold. It was really one of the more pleasant conversations with a politician I had ever had. When he left my office he said if I ever needed information for a story etc. just give him a call. He said if he was in Washington a staff member at his local Yorkville office would answer questions or he personally would call back and not three days later, as I told him often we are on deadline and many politicians only get back to us after the paper has been published (he laughed). I found myself thinking about the impression he made and what a nice guy he was. Just like countless people he worked with for decades thought. Just like the wrestling students he sexually abused first thought. They thought he could be trusted, he was a teacher and coach and mentor who they initially looked up to. And as a Federal Prosecutor said recently, his career was “marred by stunning hypocrisy.” But, in the end who cares about his career? What about the lives of the boys who are now men and still struggling with what Hastert did to them? Who knew we needed to secure our children from someone who would become U.S. Speaker Of The House for eight years, the third highest office in the land? The gentleman farmer, aw-shucks persona wasn’t typical for a politician but it sure served as his cover up as a child predator for years. A wolf in sheep’s clothing is indeed an understatement.